Card games, such as Crazy Eights, are portable and accessible to people of all ages. Playing cards can help both adults and children improve their fine and gross motor skills. 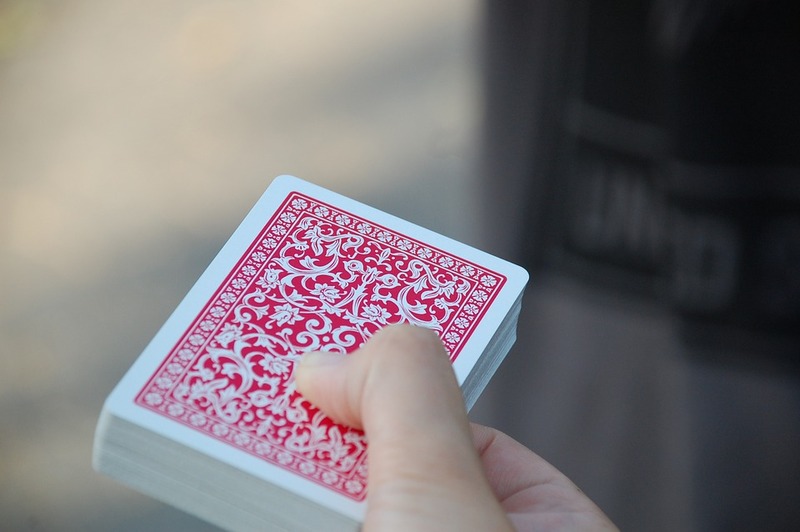 Specifically, shuffling and dealing can help quicken reflexes. Card games provide a chance to interact with others in an intimate setting while engaging in a little friendly competition. The game first appeared as Eights in the 1930s. The name Crazy Eights comes from the 1940s when United States military soldiers were discharged for being mentally unstable and were given Section 8 housing. There are many variations of the game, including Craits, Last One, Pesten, Rockaway, Swedish Rummy, Last Card, Screw Your Neighbor, and Uno. Crazy eights is a shedding-type card game for two to seven players. The game is considered a pre-extension of Switch and Mau Mau. A standard 52-card deck, without jokers, is used when there are five or fewer players. When there are five or more, two decks can be shuffled together, so everyone has enough cards to play. The object of the game is to get rid of all the player's cards to a discard pile. Each player is dealt eight cards (or seven in a two player game). Remaining cards are placed face down at the center of the table. The top card is then turned face up to start the game. Players discard by matching rank or suit or draw cards from the stockpile until they get a playable card. 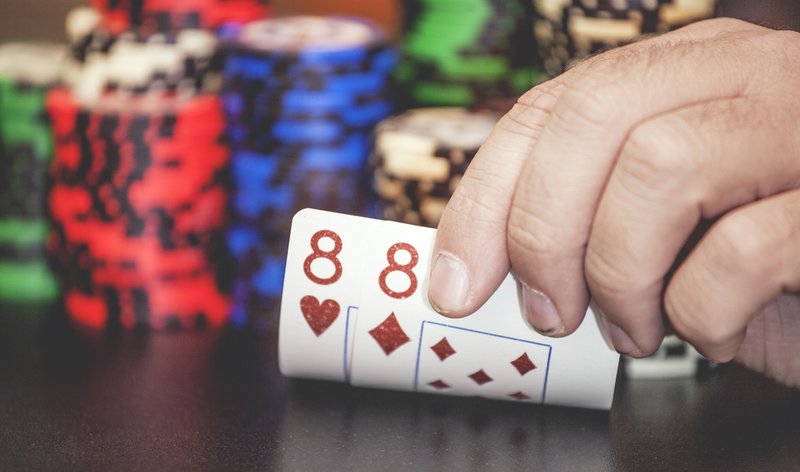 When a player plays an 8, they must declare the suit that the next player is to play, that player must follow the named suit or play another 8. If the players run out of cards in the deck, the player with the lowest point score in their hand scores the difference between that hand and each opponent's hand. The winner of the game is the first player to reach a specific number of points. For two players it is 100 points, three players 150, four players 200, five players 250, six players 300, and seven players 350. 4's and Jack's miss a turn (4's can also reverse the order). Queen of spades picks up five cards from the deck. 2's are pickup 2 from the deck. When stacked or paired with other 2's they add to the total; you pick up. For example, three 2's is 6 total cards picked up from the deck. Also, when the 2 of spades is put on top of the queen of spades, it results in pickup 7 for the following player. I Crazy 8's, 8's are wild and can be used to change suit no matter what the previous card laid down is. For example, the Queen of clubs is laid down. The next player can lay down the 8 of diamonds and changes the suit to hearts. Deal cards one at a time, face down, beginning with the players to the left of the dealer. 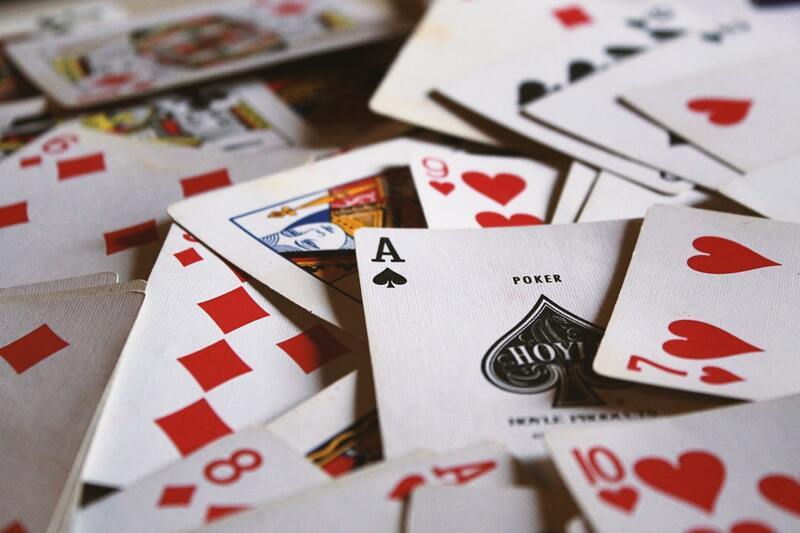 The number of cards dealt is determined by the number of players. The rest of the pack is placed face down in the center of the table and forms the stockpile. The dealer turns the top card and places it in a separate pile unless an 8 is turned. Then the 8 would be buried in the middle of the stockpile, and the next card is turned. Each player must place one card face up on the starter pile, starting to the dealer's left. Each card played must match the card showing on the starter pile, either in the suit or denomination, unless it is an 8. If unable to play, cards are drawn from the top of the stockpile until a play is possible, or until the stock is exhausted. In one variation of the game whenever the stockpile runs out the top card is removed from the face-up pile and the cards can be reshuffled. A player may draw from the stock even though there may be a playable card in the player's hand. Remember, all 8's are wild! That is an 8 may be played at any time in turn, and the player need only specify a suit. The next player must play either a card of the specified suit or an eight. Let your imagination run wild! Spice up the game with your own rules. The Zimbabwean variation offers many ideas. This version of crazy eights is more complicated, but more dynamic and has a slightly different set of rules and resembles Uno more than the basic form of the game. Five to eight cards are dealt to each player, and the remaining cards of the deck are placed face down at the center of the table. The top card is then turned face up to start the game. If a player is unable to match the rank or suit of the top card of the discard pile and does not have a special functions card, or simply does not wish to play any of the cards in their hand, they must draw one card from the stockpile. The player can either play a card or store the new card and pass their turn. Players are able to play more than one of the same number at once. There are several special cards that are either game shifting cards, defensive cards, or offensive cards. These allow the user to change the ability of the next player to play. When a player uses a 7, they "skip" the next player in the rotation. If the next player also holds a 7 and they play this before the player after them places a card, then they counter the "skip" effect and shift this to the player next to them. In a game of two players, a "skip" allows the player to play again and can be combined with kings and jacks for an uninterrupted series of play. A 7 card can be played matches the rank or suit allowances of the top card of the discard pile. When an 8 is played, the player must declare the suit that the next player is to play. That player must then follow the named suit or play another 8. If an 8 is played as a direct counter to a declaring 8, then the game will continue following the suit of the newly played 8. An 8 card can be played during a players turn regardless of the previous suit or rank. AN 8 card cannot be placed down on top of each other by the same player during their turn; they can only be played one at a time. When a player uses a jack, the play rotation is reversed, allowing the previous player to play again. The player of the jack can decide if the reversal is for the remainder of the game until another jack is played or if it is only until the previous player has played. The latter allows the jack player to play again. In a game of two players, a "reverse" allows the player to play again and can be combined with sevens and kings for uninterrupted play. A jack card can be played matches the rank or suit allowances of the top card of the discard pile. A 2 card can only be played if the last played card is a joker. When the two is played the player must say, "pick two, no pick and play," otherwise the next player may play after picking up the two cards. When a 2 is played the next player in rotation must either block with a defensive card, play their own offensive, or pick up two cards from the deck or more, if the total number of cards demanded has been accumulating. If the opponent has only the choice of picking up two cards and the opponent wants to play a card,"pick and play," must be said before the user says, "pick up two, no pick and play." A joker can be played during the player's turn regardless of the suit or score of the last played card on the discard pile. When a joker is played, the next player in rotation must either block with a defensive card, play their own offensive card, or pick five cards from the deck or more, if the total number of cards demanded has been accumulating. Defensive cards protect the player from offensive cards used on them by the previous player. In some variants of the game, when a player is picking multiple cards as a result of an offensive card played by the previous player, if the first card the player picks from the deck is defensive (an ace), they will not have to pick the rest of the cards they otherwise should have. If an ace is in subsequent picks, it cannot be played, and the player misses a turn as expected. Similar to other variations if the player runs out of cards in the deck then the top card of the discard pile is left face up, and the rest of the discard pile cards are reshuffled and used as the new deck. The game ends as soon as one player has emptied their hand using a regular card. However, not if the previous card on the pile is an offensive card or a defensive card. If a player empties their hand under these conditions, or with a special function card, the player goes "in-air." Meaning during their next turn, they must pick one card from the deck and continue playing. If a player ends the game while another player is in-air, that in-air player must pick a card from the deck. The player with the highest cumulative score points loses the round. The winner of a round is the first player to get rid of their hand by throwing their last regular card on the top or a shifting card. 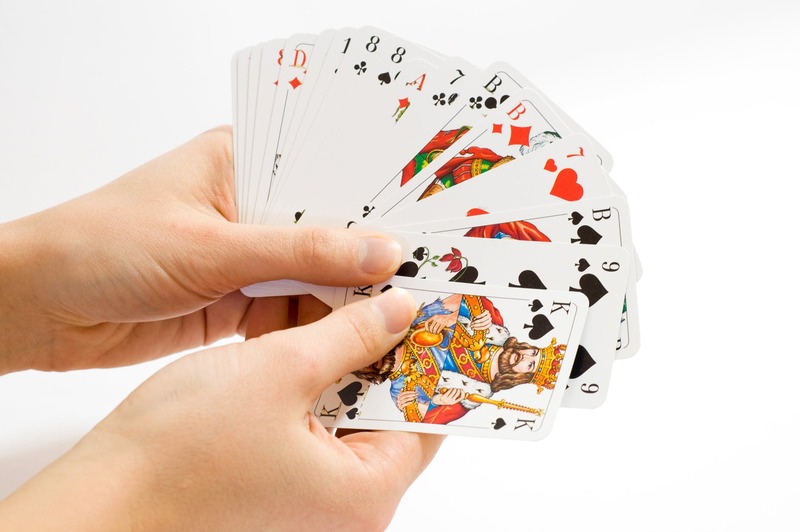 If multiple players have the same highest score at the end of a round, they must each pick one extra card from the deck until there is a clear loser of the round. If a player next in rotation has an offensive card or cumulative value after a series of 2's and jokers, before picking the number of prescribed cards, the player can ask for a Lucky Card. This is the first card on the top of the deck. It is an Ace the card is a blocking card, it can be played to block the penalty. The card is also an offensive card joker or deuce (2), it can be added to the value of the cumulative penalty and passed on to the next player in the rotation. The first card is neither an offensive nor blocking card, then the player should pick up the prescribed penalty plus the one extra card. Card games, such as Crazy Eights, require more than a deck of cards and a flat surface, which means they can easily be played almost anywhere. Some card games entail a great deal of strategy as well as an understanding of statistics and probability.